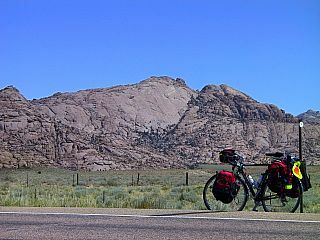 Today was another long day of riding through the heat of the Western Wyoming desert. The five of us had breakfast together at Grandma's, and then all hit the road heading northwest. Erin had told us that he was pushing himself to make Missoula as soon as possible so that he could meet some friends, and he rapidly left the rest of us far behind. We never saw him again, but fortunately we had agreed over breakfast that his shadow paradox didn't violate the rules of relativity and therefore the universe could continue to exist. The chief geographic feature of the terrain today is a landmark known as Split Rock. Settlers on the Oregon, California, and Mormon trails all used the rock as a navigational feature as they traveled overland. At one time there was an ice slough at the base of the rock that would last until late in the summer, and one 49er heading west wrote of making a julep in the middle of the desert. Unfortunately, the slough has long since been trampled into mud by grazing horses and cattle. After Split Rock we passed the ghost town of Jeffrey City. 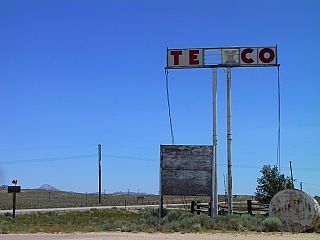 Jeffrey City had a population of nearly 10,000 back in 1980, but the economy of the town was based entirely on the mining of uranium. When the mine shut down in 1981 the town began to decay and all that is left today are blocks of empty buildings and about 50 residents. The only two businesses still operating are a liquor store and a bar, and we stopped at the bar for some water and lemonade before heading back out into the heat. Ten miles outside of Lander we reached the Hart Range RV Park where it had been decided that the mothership would be spending the night. I wanted to make it all the way to Lander where I was planning a motel night, but decided instead to stay the night with Mark, Emily, and Jackie and then take tomorrow off in Lander. Enter your email address to be notified of updates.